Writing is a matter of passion for many people. In fact, some persons would like to share their realm of thoughts and thus influence others through their write-up. For such people, sharing their articles through an auspicious channel like a guest blogging or Pay Per Post or a subscription pack website would be one of the most convenient media as it ensures a great degree of exposure to numerous audience. However, giving someone backend access to WordPress as an author may not be a good idea because who knows what's inside a stranger's mind. 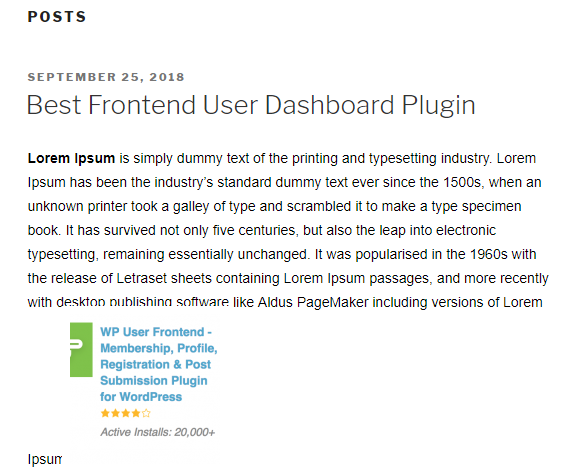 For safety concerns, you should use a frontend user dashboard plugin instead of giving access to the backend. 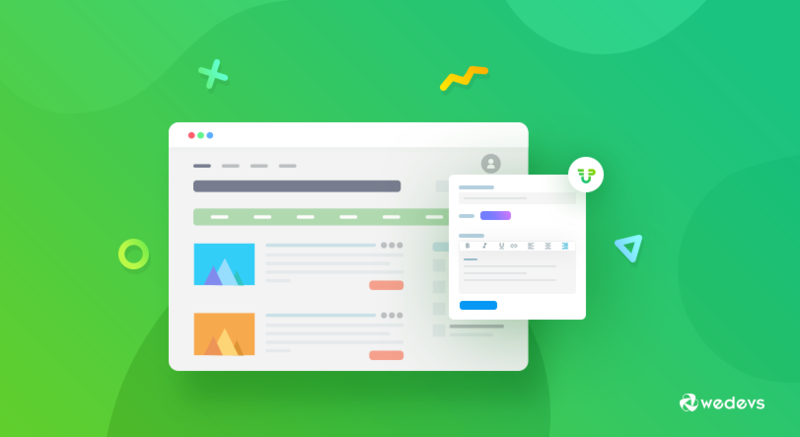 Today, in this article, we will be discussing how you can allow the guest user submitted posts in your website using the free WP User Frontend – all from the front end of your website! Assuming that your WordPress website is up and running. Now go to the WP Admin Dashboard → Plugins → Add New. 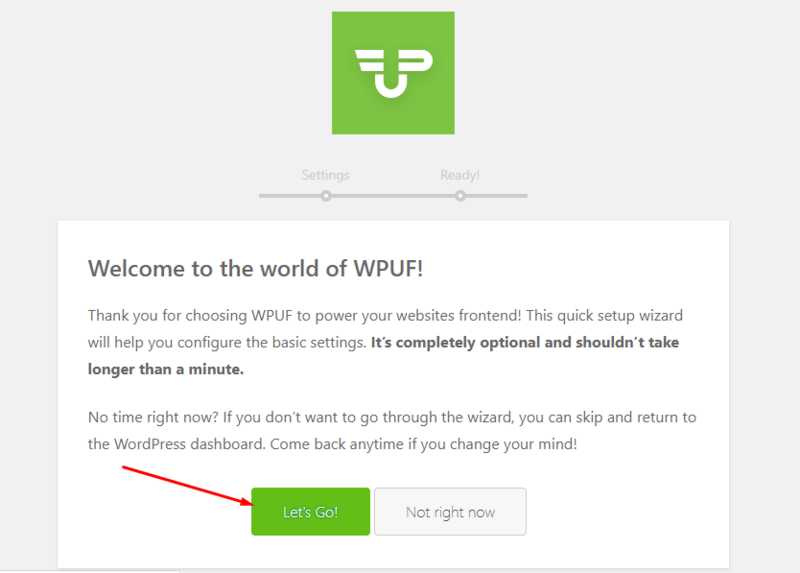 Now write ‘wpuf‘ on the search bar and hit the enter button to find the plugin from the WordPress directory. After that, install and activate the plugin like any other WordPress plugin. Next, you will get a brief setup wizard. Hit the “Let's Go” button to proceed. 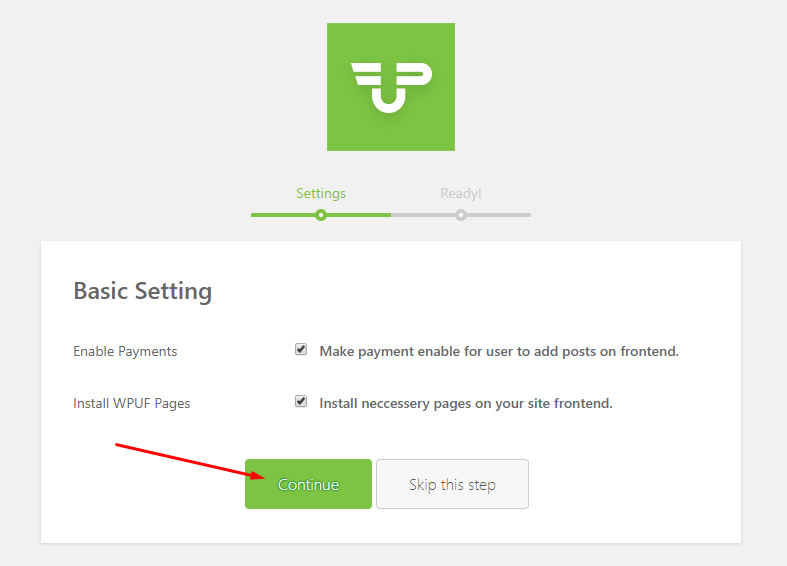 Now, Keep the “Enable Payments” and “Install WPUF Pages” checked and click on the ‘Continue‘ button. Still in trouble? Then walk yourself through our official documentation from here. Now that you have successfully installed and configured WPUF, you will have to create and publish a sample post form. 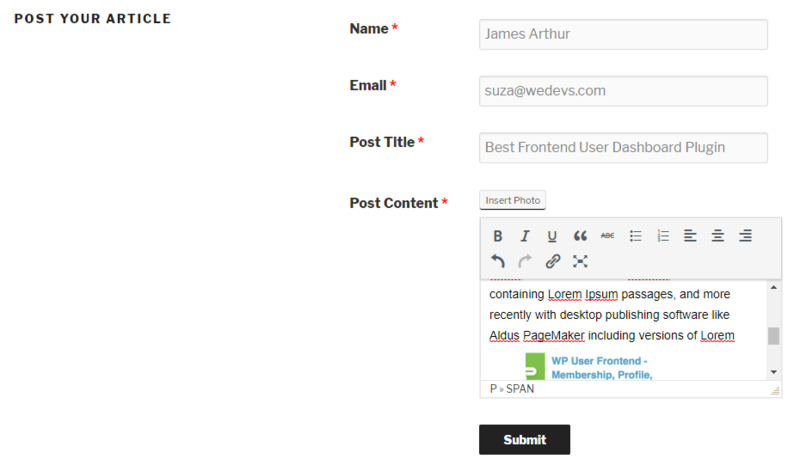 First off, navigate to WP Admin Dashboard → WPUF → Post Forms. After that, you can select the Sample Form to edit. Or, you can also hit the Add Form button to create a post form from the scratch. Next, copy the shortcode of the newly created post form from the editor. You can copy the shortcode by simply clicking the code with the left button of your mouse. Go to WP Admin Dashboard → WPUF → Post Forms → Settings → Submission Restriction. User details: Keep this option unchecked if you want to make the name and the email address of the guest user required. Name Label: As the name suggests, you can change the label of the ‘Name' field. Email Label: Like name label, you can change the ‘Email' label too. Email Verification: Use this option, to verify the authenticity of the email provided by the guest user. Now, click on the Save Form button and hallelujah! you are done with configuring the guest post form. How will the guest user view from frontend? Now, if a guest user gets on the posting page, he or she will find the post form we created just like below. On submission of the article, the guest will get this message indicating to confirm the email address. And here is a sample of the submitted post by the guest. As an admin, you will also get a notification mail each time a guest user posts an article. You will also be able to block the notification mail if you want. Learn more: Is it Possible to Charge your Guest Bloggers for Publishing Posts? The guest blogging service of WP User Frontend comes up with free of cost. But what is more important is that the plugin will reduce the chance of getting your website hacked by the guest users. Because the backend of WordPress is easily vulnerable and prone to be attacked. As a bonus, you don't have to create user roles from the backend every time a guest article is posted on your site. Finally, if you are an advanced user then you can avail the premium versions to achieve more control in adding the custom fields like uploading files, embed audio or video files, google maps, integrations with popular platforms and so on. ← Did You Know These Facts About Matt Mullenweg’s Life Journey?